The telescoping adjustment lets you easily move the thumb from stowed, to any of several working positions in seconds with no tools and no extra parts. The Barracuda uses the taper of the dipper stick, as well as clamping force on the sides, to prevent any slipping and resulting damage to hydraulic lines or cylinders. 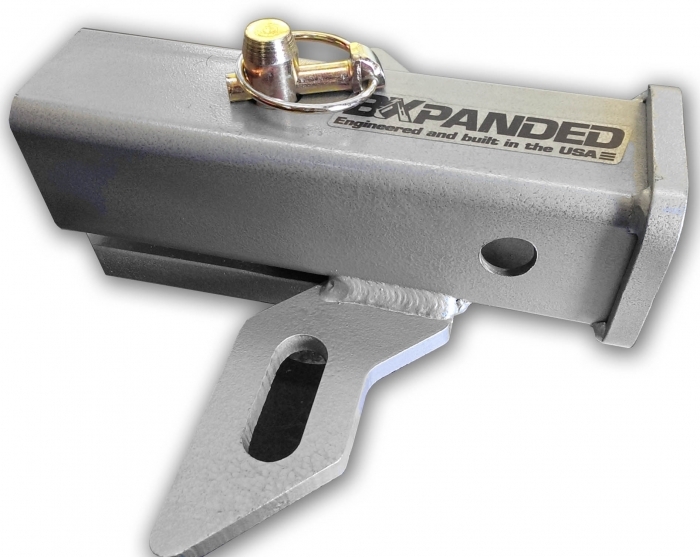 It’s built with US made, 3/8” thick steel, with all the strength you’ll need to use every bit of the power of your machine. It’s TOUGH! Just like the job you have to do! The Barracuda comes in great looking hammered silver finish that compliments any color. 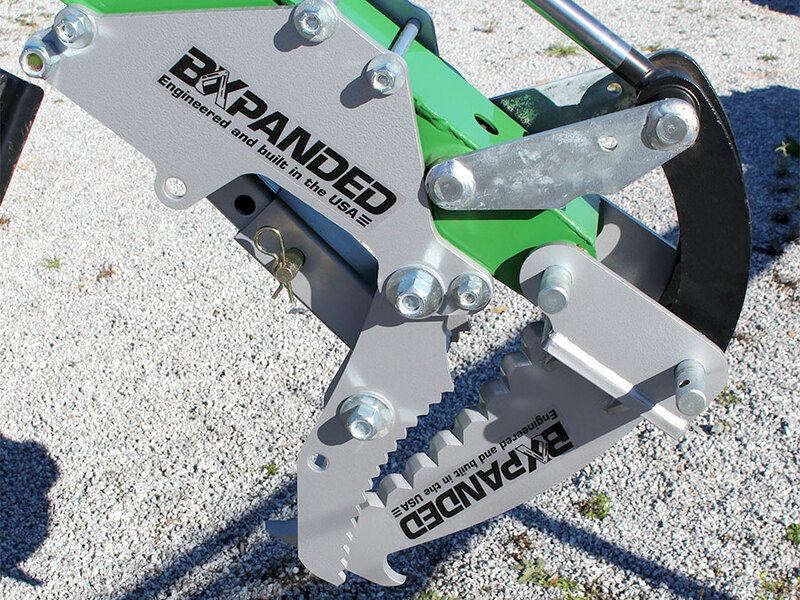 It’s shipped fully assembled, and takes less than 5 minutes to install using included instructions with no modifications to your tractor. 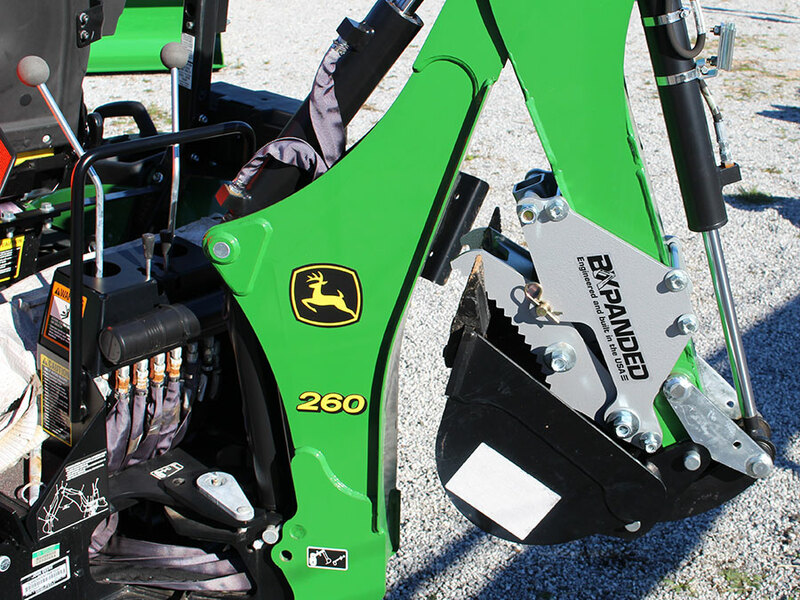 Fully compatible with all other BXpanded John Deere 260 Backhoe Accessories and John Deere factory buckets. I purchased the Barracuda thumb before I took delivery of my John Deere 1025r and 260 backhoe because I was pretty confident it would do the job.&return&≠wline&&return&≠wline&After installing the thumb on the backhoe, I immediately went to work tearing out willow bushes, stumps and beaver dams--It has not disappointed me.&return&≠wline&&return&≠wline&The thumb takes every force the backhoe can apply to it without bending, and can even be used as a reverse ripper tooth without fear of breakage. 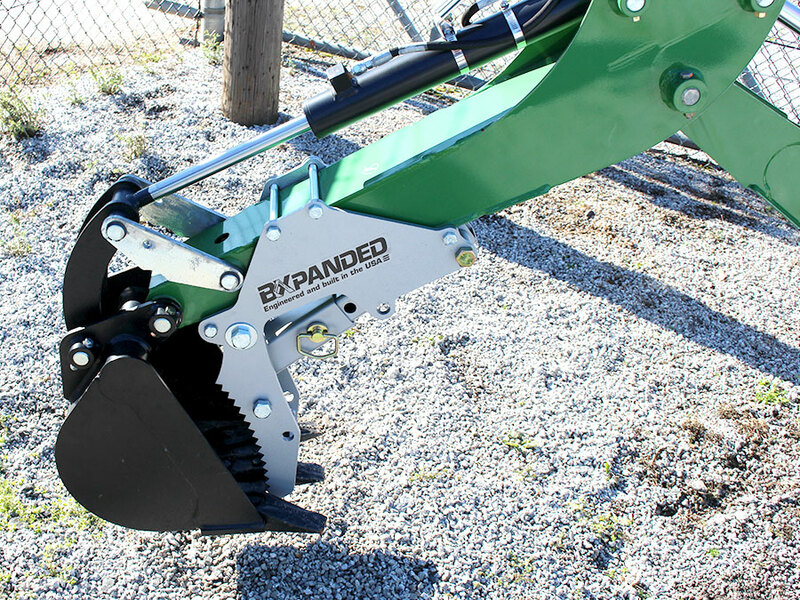 It's a great piece of equipment, and my backhoe would be a quarter as useful without it.&return&≠wline&&return&≠wline&The Barracuda is adjustable, letting you choose the right setting for your particular need. 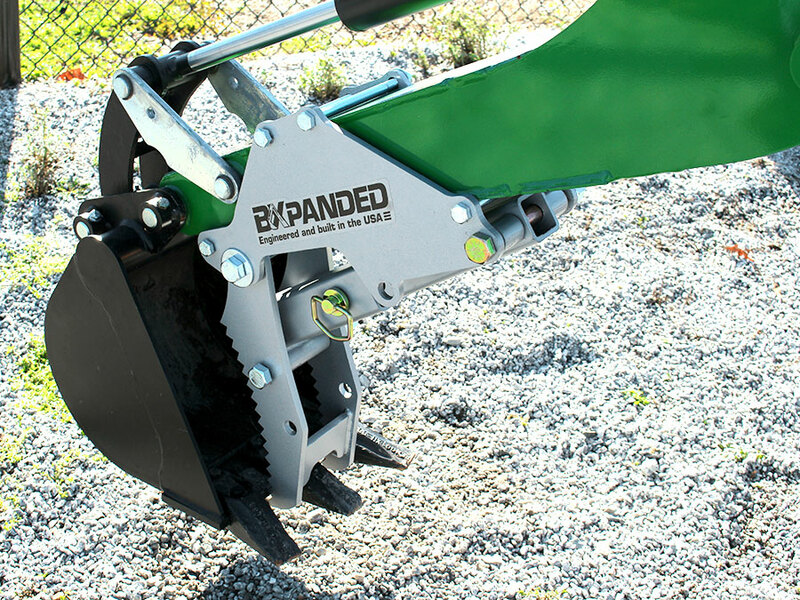 Its ability to fold out of the way makes for quick work when you need to simply use the bucket of the backhoe. &return&≠wline&&return&≠wline&Get a Barracuda; you won't be disappointed. I purchased the thumb thinking it would be great to remove all of the old landscaping and boarders. WOW once you have it you realize how versatile it makes the little tractor. 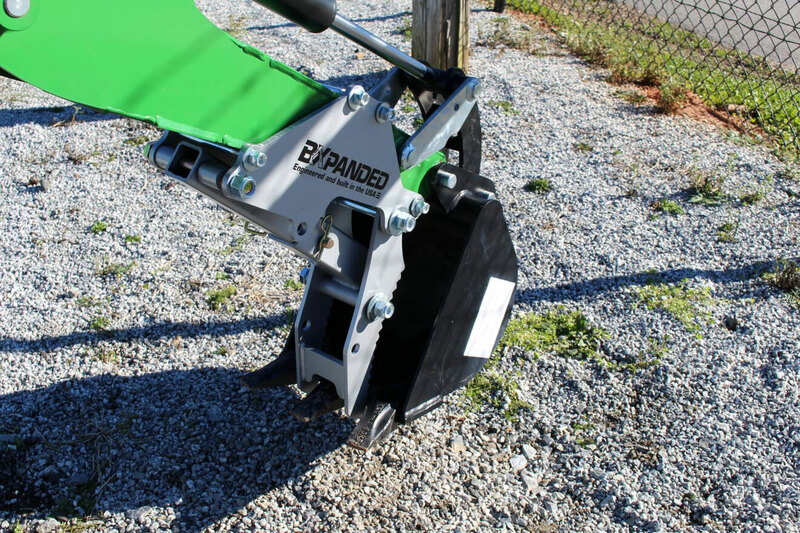 It does not increase lifting limits but does make placing and removing and loading larger objects much easier. So easy to install had it done in minutes. A must have for those wanting the most out of their machine. Only took 7 days to get it via UPS, install was super easy, lots of options for thumb placement, including inside my 12 bucket, makes breaking up those small branches an easy job.&return&≠wline&Hold a ton!&return&≠wline&Very happy. If you have a backhoe, you need a thumb. This thing fit great!! Easy to install!! Easy to use!! Built extremely well! !